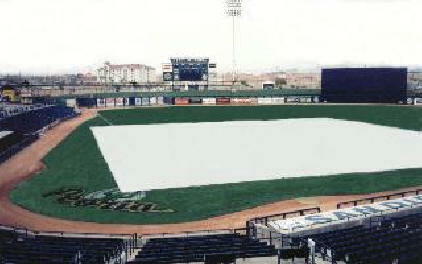 The Athletic Field Covers are constructed of UV treated woven coated polyethylene materials. All materials used in the construction of the field covers are domestically produced and the covers are put together in the United States which assures the best possible quality. The covers are manufactured using either a 6.3 oz per square yard silver/white fabric or a 7.4 oz per square yard blue/white fabric. All fabric used is in 12' widths reducing the number of seams on the covers. Western Ag Enterprises, Inc. invented, heavy-duty pull handles that are installed on all four sides of all covers, spaced every 12' and also in the corners. These pull handles reduce the number of people needed to spread and refold the field covers. These superior covers are being used by major league baseball parks, major league spring training parks and numerous universities, colleges and high schools.